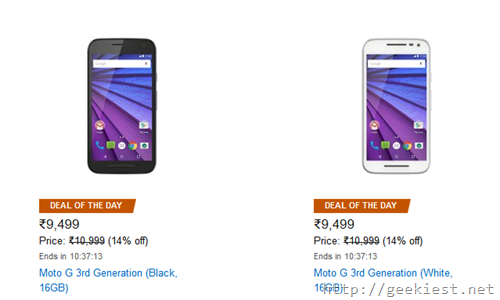 On Amazon India you can get a flat INR 1500 off on the Moto G mobile Phones. 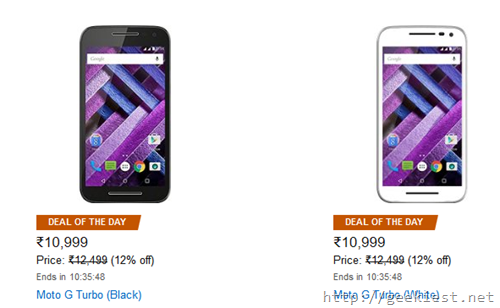 The Moto G 3rd edition 16 Gb versions are available for INR 9,499 which sells normally for INR 10,999 (INR 1,500 Off). Moto G turbo is available for a price of 10,999 while the normal price of the device is 12,499 (INR 1500 OFF). This is a time limited offer so go ahead and grab the phones if you were planning to buy them. water and dust resistant Moto G turbo android smart phone with turbo charging available in India.